Remote teams are becoming more and more prevalent as more people work from home. Although working from home tends to boost productivity, eliminate sick days and commuting, it can also make communication more difficult. As businesses grow and hire more employees, communicating as a remote team becomes crucial. Read along for some of our best tips for staying connected in a home based career. There are several programs out there that can make communication and collaborative work much easier. Google Drive features word documents, spreadsheets, forms, presentation templates, and other options that allow you to work as a team. The best thing about Google Drive is that it consistently saves and updates the documents, and you can share them in real time amongst your team members. Additionally, it’s a free service. For chatting, Slack is an option that allows you to speak to your team throughout the day, while saving conversations and making things more streamlined. It’s the perfect place to message, share files, and collaborate in one location. Lastly, you can try an option such as Basecamp for client management and team communication. There are “Projects” for each client, and each member of the team can add notes, Discussions, files, folders, and so on. An added benefit is that you can share this data with your clients, taking your collaboration to the next level! High-tech programs are great, but sometimes a little bit of communication is all you need. Texting is an informal way to stay in touch with your remote team. If your team is smaller, or more casual, you can begin a work group text and keep in touch throughout the day. You might even create specific check-in times and a protocol for using the group text. This can also be fun, as chatting with your team also fosters stronger relationships and bonds that go beyond the workplace. Meetings are incredibly important for remote teams! Since you don’t see each other very often, communication is key. Keeping a running meeting on a daily, weekly, or monthly basis is crucial. Depending upon the size of your team, the complexity of projects, and other methods of checking-in, the scheduling around these meetings might change. Either way, keep meetings productive, quick, and as a way to check in. Do you need to address client issues daily? Set it up. 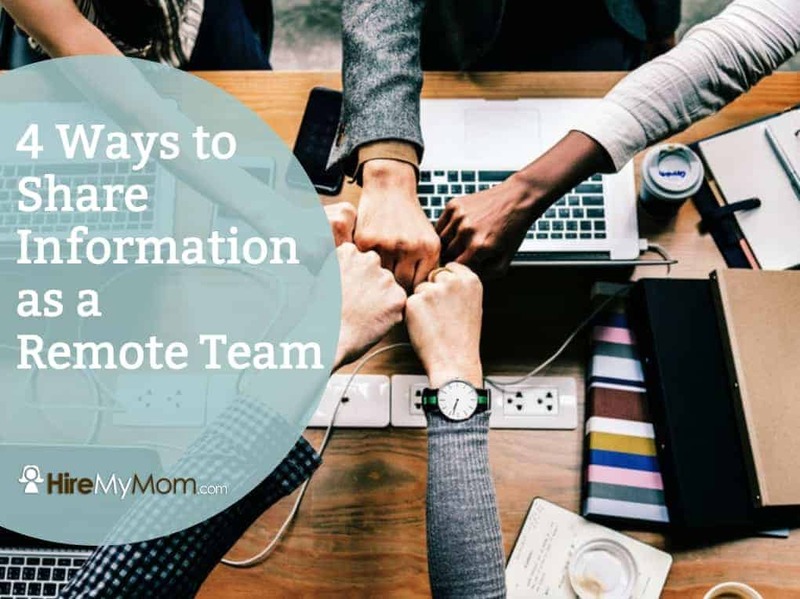 If a weekly meeting is enough, keep it to a format that works for everyone, and create a schedule so that team members feel heard, productive, and that they are using their time wisely. Expectations aren’t just important on an individual basis for at-home employees, they’re also needed for teams. We already addressed meeting and check-in schedules, but what else is expected of your team? Do you require detailed time sheets? Client or work summaries on a daily basis? Set these parameters up front, and be honest about them in the hiring process. It’s important to stay out of micromanagement territory, but there’s still a great need to stay on top of employees. Since you aren’t meeting in the traditional office daily, keeping tabs is more than fair. Simply establish a schedule, protocol, and method of expectation that works well for everyone and their schedules.